The question put forward this week at SFFSeven is the open-ended “What’s on your mind?” (i.e., there’s no real topic this week), and frankly any given week, the big thing on my mind is Maradaine. Because, frankly, you can’t write four intertwining series set in the same magical city without it occupying a fairly sizable portion of your brainspace. How that’s manifesting right now is two-fold. One is drafting The Shield of the People, which I will confess I was having some challenges with, but– thanks to the other part of the manifestation (see below)– I’ve figured out a large chunk of what my problem was and have hacked through that to see the problems in my initial outline. The other part has been a massive reorganization and re-examination of the material and notes. 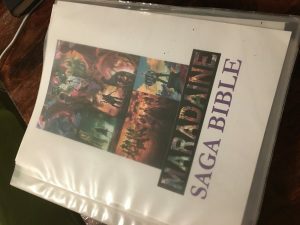 I talk about spreadsheets upon spreadsheets, and that’s key, but a good part of what I need to do is have a Saga Bible for the whole Maradaine project. And every year or so I need to just plain STOP and clean it up, maintain it, and get it up to date. Especially when little changes to the larger picture have created a butterfly effect. For example, I don’t have accurate summaries of THE IMPOSTERS OF AVENTIL or A PARLIAMENT OF BODIES— I have summaries of the outline as they existed before writing the actual books. So I’m rebuilding a lot of the material in the Saga Bible from the bottom up right now. Which is something of an undertaking, but a valuable one, because it helps keep the material fresh in my mind, and helps me see the bigger picture. Which I needed to get through the wall I was having with SHIELD OF THE PEOPLE, as well as getting me in the needed headspace for writing THE FENMERE JOB and PEOPLE OF THE CITY. So that’s how I’m keeping my head on now. Hope I can keep it there. Y’know, any number of authors have turned their “saga bibles” into published books. Just sayin’. But usually after the other work is already out there. Pfft. Mr. Jordan and Mr. Martin say it’s not necessary. Another possibility is a Wikia, I created two for a webserial and a story on DeviantArt. The advantage s that the readers are making the work for you. True, but that sort of thing has to occur organically– that some dedicated superfans put it together. I was for the two Wikias I created, but I had family problems, and they are now very rarely modified, it’s true.